Today, the House stands firmly to proclaim to the world that genocide is happening, that evil is real, and that it must be stopped. Leader McCarthy spoke with Maria Bartiromo on FOX Business this morning, discussing the House’s focus on policy ideas to overcome the challenges facing America. 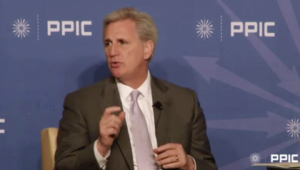 Leader McCarthy joined PPIC for a wide–ranging discussion about the critical issues facing the state and nation—from water to terrorism to the economy. President Obama’s regulations are a punch in the gut to our oil and gas workers who are already reeling, and the House will fight back against this regulatory grandstanding. Judy and I wish him and his wife Vicki all the best and thank them for their service to our veterans, the great state of Florida, and our country.